Twitter stock has been trading within a sideways channel over the last six months with upper boundary the 37.10 resistance level and lower boundary the 26.20 support barrier. Currently, the price is trying to climb above the 200-day simple moving average, creating a bullish rally. From the technical point of view, the Relative Strength Index (RSI) is strengthening its momentum in the positive zone, approaching the 70 level, while the MACD oscillator is trying to surpass above the trigger line, confirming the recent slight upside movement in price action. Further advances could drive the price towards the upper boundary of the trading range of 37.10. If the bulls take control and shift the outlook to a more positive one, this could increase the momentum until the 41.50 resistance barrier, identified by the low on July 2018. 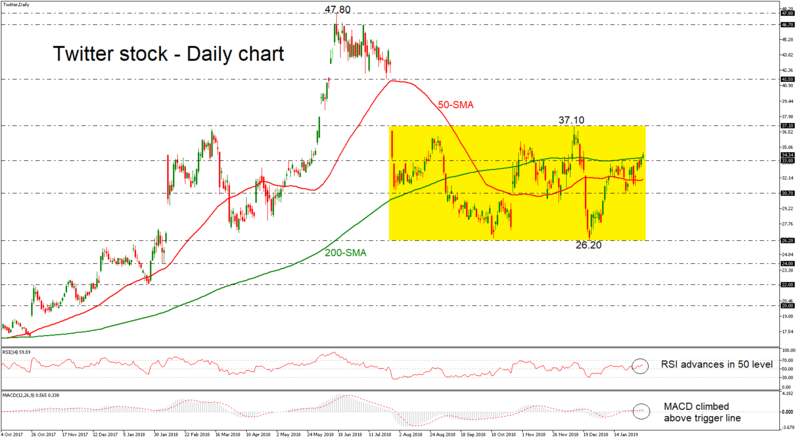 In case of a significant bearish movement and a dip below the 200-day SMA and the 33.80 support, the next level for investors to watch is the 50-day SMA currently at 32.00. More declines could also touch the 30.70 hurdle, taken from the latest lows. Overall, Twitter stock would change the medium-term neutral outlook if it jumps above the 37.10 region or if it falls below the 26.20 mark.